Yesterday a Madeira tasting was held at the Astor Center in New York. I knew relatively little about Madeira before the tasting, I confess, other than that I really liked it. A dear friend, Rodolphe Boulanger of the Wine Messenger has been decanting Madeira’s virtues for some months but I had not had the pleasure of tasting too many before yesterday. I was quick to remedy that and tasted through many of the ones offered yesterday. The wines were great and what a treat on a Tuesday morning in June. Madeira is a fortified wine that is comes in a variety of styles from dry to sweet. It can be served as an aperitif, at different places during the meal or with cheese and dessert at the end of the meal. This versatile wine has been at home in the United States since the 17th century, In fact, George Washington toasted the Declaration of Independence with a glass of Madeira. I may follow suit this July 4th. As an aside, I’m a July baby so if anyone wants to get me a present and doesn’t have any ideas, Madeira is a very welcome gift :). Madeira is made from essentially six different grapes: Sercial, Bual, Verdelho, Malmsey (Malvasia), Terrantez, and Tinta Negra. This last is actually the most widely planted of the varieties but can’t be listed on the label as the others can. The star of the show was a D’Olivera Reserve Boal from 1922!!! Thank you Manny Berk for bringing that delicious wine. I could get it by the glass at a New York restaurant but the price is a bit steep for me. It was a gorgeous deep brown with beautiful flavors and aromas of nuts, molassses, fruits and cedar. It was so complex and elegant that I finished it without a second thought. This may be my new favorite wine but I did taste others that perhaps were affordable. This would have been on my bucket list but luckily I can now check it off. At a seminar led by Robin Kelley O’Connor of Sherry Lehman fame earlier in the morning, we tasted a Verdelho from the Barbeito Historic series. This series is named after cities. The Verdelho is called the Savannah Special Reserve and it was special. The perfect combination of sweetness and acidity. It was a very nice expression of this grape variety made in this style. Both the Barbeito and the D’Olivera wines are imported into the United States by the Rare Wine Company owned by Manny Berk. Madeira has one very special vinification process that separates it from other wines, the wine is heated, either through the use of a hot coil into a tank of hot water in the walls of a tank. This method is called the Estufagem and is continued for never less than three months at a temperature of between 45 and 50 degrees Celsius. After this period, the wines are left to ‘settle” for three months. The wine is never released before October 31th of the year after the harvest. The wines that are chosen for aging are put into large oak barrels called Cantiero. These wines spend two years in the bottle and are on the market after three years. They are often put on a higher floor of the winery so that they will be subjected to higher temperatures. Like in sherry, an oxidative process takes place with a portion of the wine evaporating and the remaining wines becoming more concentrated. We were told that this is one of the reasons that Madeira has such fabulous acidity. Apparently the concentration enhances the acidity. 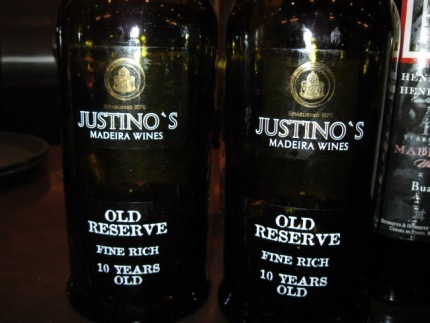 Adding an older and therefore more concentrated Madeira to a younger wine will raise it’s acidity level. The island of Madeira is very beautiful and is volcanic in origin. The site of a very tall peak, Madeira has many microclimes and many small producers who cultivate tiny properties. According to the producers present yesterday, there are few “vineyards” as we imagine them, the largest is owned by Blandys. This is because of the difficulty of the terrain. The island is also well known for its series of Levadas or canals which bring water down from the mountains. Harvesting on Madeira basically has to be done by hand because of the aspect of the slopes and fragmentation of the growing areas. The grapes are brought into the cellars and fermentation is started using ambient yeast. Essentially fermentation is stopped by the addition of alcohol. When this is done depends entirely upon what type of wine the producer is interested in making. I liked all of the wines that I tasted yesterday but am somewhat partial to the drier styles. D’Olivera Harvest Terrantez 1988 was very interesting and quite full bodied with rich and nutty notes. It was beautifully balanced with great acidity. D’Olivera Sercial Reserve Special 1969 also stopped me in my tracks and was so well integrated that I could imagine drinking it throughout the meal with its dried fig and fruit notes. This house traces its heritage back to the 1820s and is run by a fifth generation Madeira family, somewhat of a rarity these days. The current company is a smallish producer but in the past has incorporated five other Madeira houses. According to Manny Berk, there is extreme concentration in the industry. Berk is a passionate importer of Madeira who told me he got started importing Madeira almost by accident after having had the opportunity to buy a cache of vintage Madeira. Apparently earlier in his career he was a wine write and author. These days, he’s a great Ambassador for Madeira in the United States. Sounds like a career path that might be to my liking. I tried a number of great wines from the Broadbent collection as well. I know some of these wines and have had their Colheita. I very much enjoyed the Malmsey 10 year old and the Fine Rich 5 year old as well. I tried the Justino’s Madera Rainwater which is 95% Tinta Negra and was it quite pleasant as well. My understanding is that Justinos and the Broadbent’s use the same enologist. The Broadbent family has been linked to Portugal for many years and are strong supporters of the island. 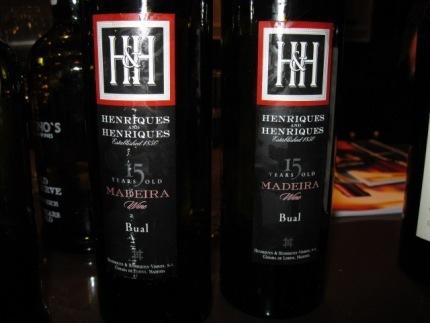 Of the Henriques & Henriques, a historic house from the 1800s, my favorite was the 15 year old Bual. Fabulous acid/sweetness balance as well as lovely tertiary notes and a smoky dense background. This wine would make me very happy for a long time, sitting open in my home. Of the Blandy’s brands, I was impressed with the Sercial 10 year old which was elegant and floral and with the searing acidity of the Cossart Gordon Harvest Bual 1997. 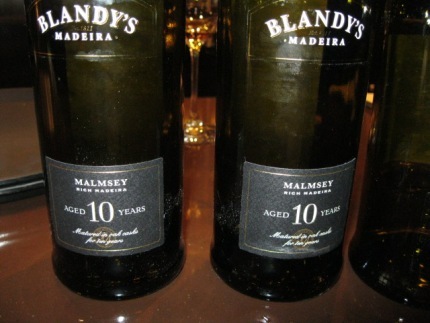 Blandy’s is the world’s largest producer of Madeira. They have a variety of brands under their label including Blandys, Cossart, and Leacock. No stranger to innovation, they are making a big push to promote Madeira throughout the world. They have also created the first blend of Malmsey and Bual. The resulting wine called Alvada is interesting. I could go on and on but I’ll stop here. My next trip will definitely be to Portugal and to Madeira which is about as far away from Portugal as Easter Island was from Chile. I won’t let that stop me though, it hasn’t in the past. Astor Center, Barbeito, Blandys, Broadbent, D'Olivera, Henriques & Henriques, Justinos, Madeira, Portugal, Rare Wine Co. Beyond jealous! I love Madeira. Never had a Terrantez, am dying to try one.